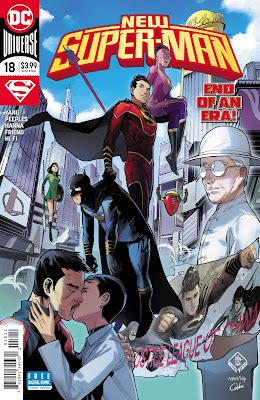 This, I believe, was intended to be the final issue of New Super-Man—and it is, I believe, but it will be followed by New Super-Man and the Justice League of China in…February, I think? I should probably know this. Anyway, I expect this will wrap up the story with All-Yang and Kenan’s Qi and what-have-you, and pick back up with this terrific cast of characters in the new year! 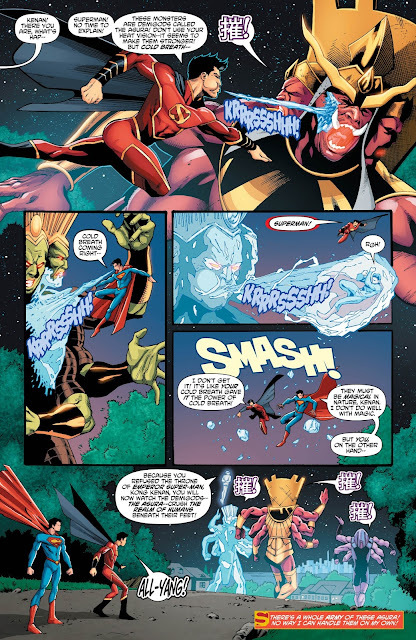 Take a look at how this whole mishegoss wraps up in my review of New Super-Man #18, just below! As a comics reader and reviewer, it has been a real pleasure to get to know this book. Truth be told, had I not started reviewing it I probably wouldn’t have kept picking it up month-to-month, but I am sincerely glad that I did because it’s one of my favorite titles every time it’s released. I’ve said it before, and I’ll say it now: this has been the most consistently good title of DC Comics’ Rebirth, with the previous issue being the only true “dud.” Some of that owed to the artwork…which thinking about it now, probably sucked because the end of this series had to be re-tweaked to allow for its continuation. Still, I want this initial series to end strong, and definitively, so it can get whatever brownie points a comic book series is owed when someone feels unnaturally positive about it. 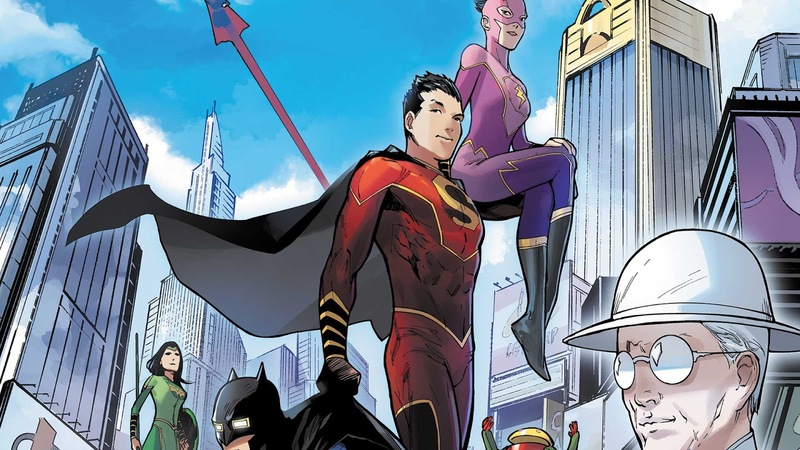 I want to be able to proclaim that the three trade collections of New Super-Man (or perhaps a forthcoming hardback deluxe edition!) are worth putting on your bookshelf, despite what misgivings you may have. And I’m glad to say…it ends okay. It’s not perfect, but it’s satisfying. There’s a little bit of mumbo jumbo in here, but nothing beyond our ken and it all fits together to explain why Kenan suddenly has the Yin/Yang symbol in an “S” shape within the octagon on his chest. It seems that, with the All-Yang dispatched (spoilers…I do warn you in the title of this review) Kenan is now tasked with establishing or embodying balance—which means that when he needs to get rid of the endless stream of gigantic Chinese demons strolling through the hellgate, he doesn’t need to use his powers—he needs to power down, and become just Kenan again. 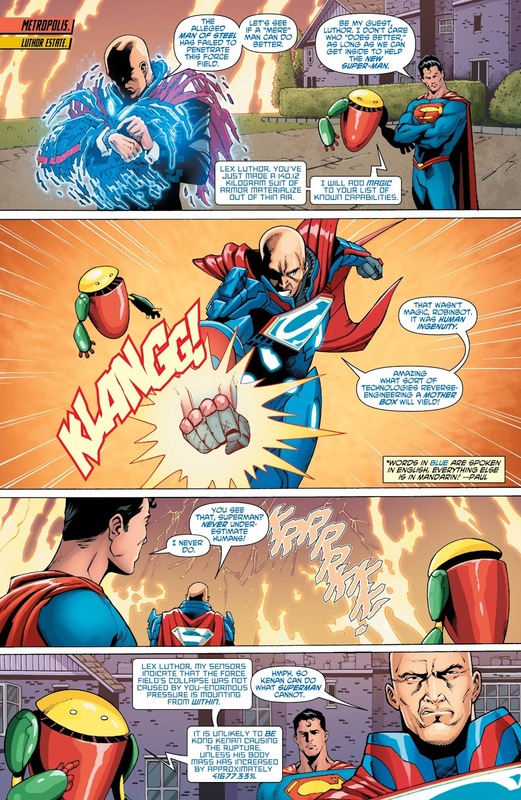 And that’s cool, that he can become totally vulnerable and human again, though perhaps he should have established a secret identity before blowing his wad earlier in the series. 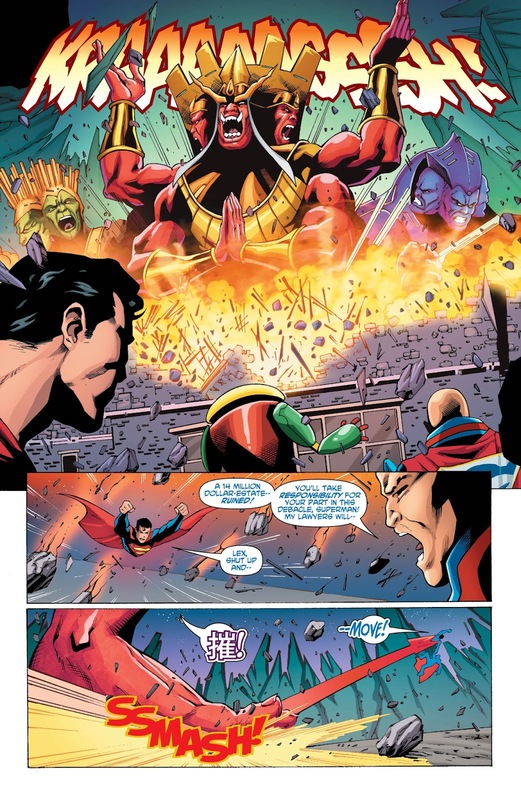 And before the crazy demons are disintegrated, there’s some great teamwork within the Justice League of China, and with the Justice League from America, who also show up to pitch in with the Godzilla devils. Besides re-establishing this book in DCU continuity, it’s always good to see the Justice League at least acknowledging world-threatening disasters that might happen in more “minor” books. 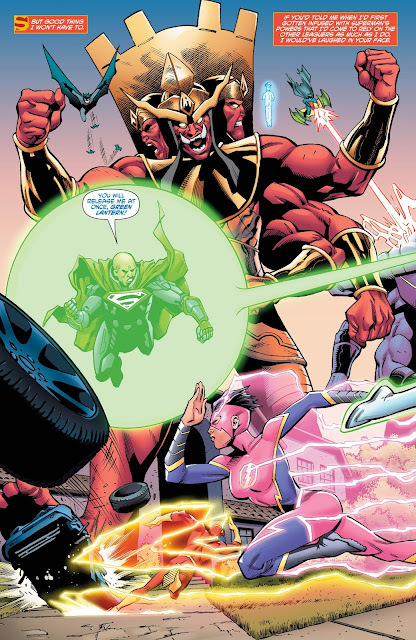 There’s also the story of Yin and Yang in here, and a next-to-last page reveal of the Green Lantern Corps of China, which is only what we’ve wanted to see all along! Ultimately, the ending is Kenan telling his mom and dad that he’s gonna go his own way with the Justice League of China, which is a new book debuting next year that I can’t wait to read! The big detractor from this issue was, once again, the artwork. I can appreciate that these last few issues probably had to be rejiggered at the last minute when the new series got the green light, and this issue does look miles better than the last one, but as the conclusion to this great progression of Kenan Kong’s character it was a little disappointing. There is an issue #19, which I assume will serve as a bridge to the next series, and perhaps that one is visually a little stronger. As for the story, I thought this was pretty satisfying, and surprised myself by how much I’d gotten into this Qi stuff, since normally I get turned off when comics get too esoteric. But this all seemed to work and make sense, and adds an interesting element to Kenan’s powers that I’m sure will make for some good mishaps in the future. I still say this has been the most consistent series from DC Comics in the last two years, and if you read the thing in trade paperbacks you probably won’t be disappointed—but see if you can get that third trade from Half Price Books or something, yeah? 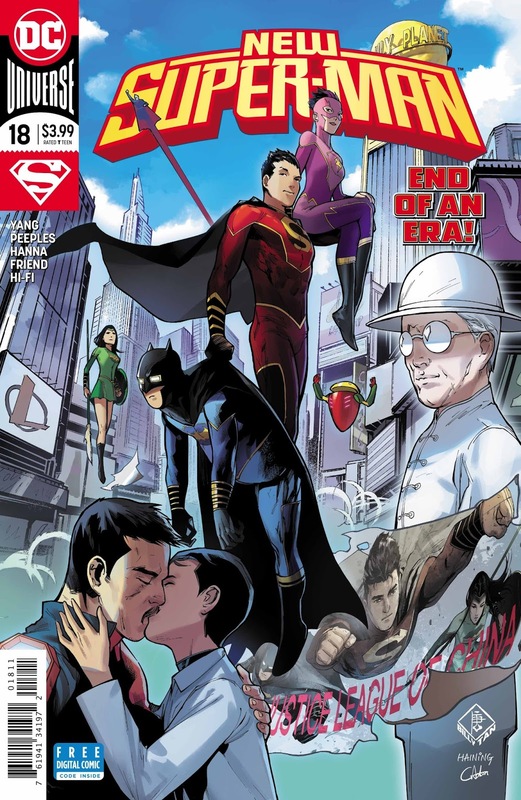 What was supposed to be the final issue of New Super-Man does provide a satisfying capstone to Kenan's character growth, among some terrific action featuring the Justice Leagues American and Chinese. I'm not complaining! The artwork is somewhat sub-par and bland, which is disappointing, but did nothing to dampen my anticipation for the next series!